Police had to clear the tracks as another train arrived. A suspected homeless man was killed after being hit by a train in Najomtien. 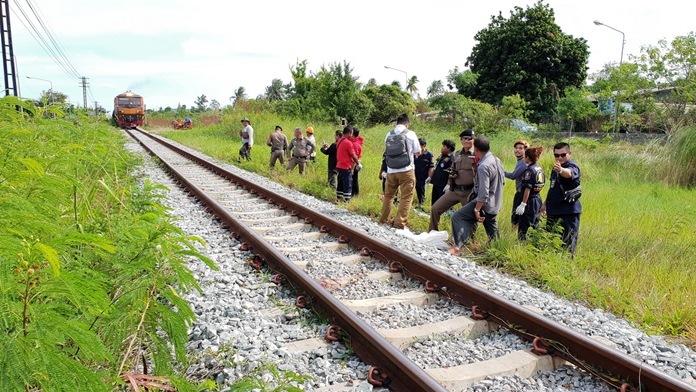 The unidentified victim, who carried no identification, was found around 7:30 a.m. Aug. 2 at the rail crossing on Najomtien Soi 1. Despite his long hair, dark skin and tattoos, police said no one knew who he was and likely was a vagrant. State Railway of Thailand worker Leamthong Sukpanitch, who found the body, said the man likely was killed around midnight, as two cargo trains had passed through the area.